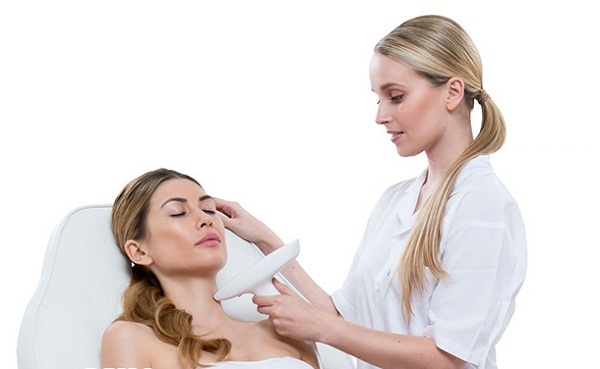 Venus Viva is a non-surgical solution for skin resurfacing that corrects signs of skin damage and improves the appearance of acne scars and other scars, stretch marks, rosacea, enlarged pores, deep wrinkles, and uneven skin texture and pigmentation. When it comes to skin resurfacing, CO2 lasers used to be the frontrunner, but these procedures also came with a lot of pain and downtime that could last several weeks, if not longer (since they essentially remove the top layer of your skin). Venus Viva skin resurfacing treatments, on the other hand, deliver the same results, just with significantly less pain and much lower downtime. And unlike lasers, which only work for fair complexions, Venus Viva treatments are safe for all skin tones. You’ll also notice much better results than with superficial treatments like chemical peels and microdermabrasion. Venus Viva skin resurfacing treatments work with tiny pins that safely deliver heat (via NanoFractional Radio Frequency) through the skin’s surface. This creates tiny micro-dermal wounds, which the body naturally heals on its own. This process repairs signs of skin damage visible on the surface of the skin. Since the wounds are so small, the treatment is much more comfortable than traditional CO2 lasers, while still producing incredibly visible results. Am I a good candidate for Venus Viva? I have beautiful tan or dark skin - can I still have Venus Viva treatments? Yes! Venus Viva is safe for all skin tones – light, dark, and everything in between. What does a Venus Viva treatment feel like? Will it hurt? When the treatment begins, you will feel a tingly sensation on your skin followed by a little zap. You will also being to feel flushed and warm, similar to the feeling of a mild sunburn. Most patients do not find their Venus Viva treatment painful. However, should you feel any discomfort, we will be happy to apply a topical numbing cream to ensure a relaxing and comfortable experience. When will I see results and how many treatments will I need? You will usually start to see improvements a week after the first treatment. To achieve their desired results, most patients require three or four treatments per area. However, all bodies are different – the exact number of treatments you require will depend on your body’s needs and your goals. How long does a Venus Viva treatment take? Each treatment will take 15-35 minutes, depending on the size of the area being treated. How often can I have a Venus Viva treatment and how far apart should the treatments be? To protect your skin and ensure that you get the results you are looking for, Venus Viva treatments are done four weeks apart. Before you begin your Venus Viva treatment, make sure that your skin is clean and free of any lotions, creams, perfumes, powders, or makeup. To ensure that your personal belongings do not get damaged, make sure you remove any jewelry around the treatment area. Finally, if you have excess hair on the treatment area, make sure you shave it before your treatment.